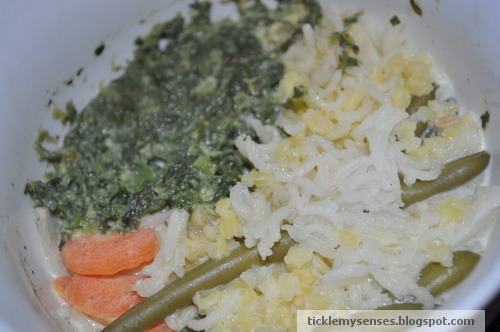 Tickle My Senses: Tickle My Baby Series - Baby Food- 7 months onwards: Simple Vegetables with Rice and Lentils. 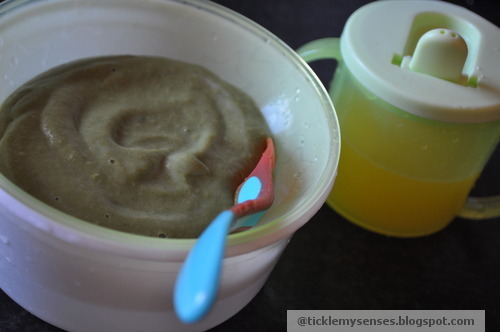 Tickle My Baby Series - Baby Food- 7 months onwards: Simple Vegetables with Rice and Lentils. Well its been on my mind for a long time to make a record of all the things we did for baby, things we bought for him, the essentials, the not so important, bath, nappy, clothes etc etc.......just as a future reference for ourselves and as information for first time moms who might be interested. So introducing the "Tickle My Baby Series". Well the hardest part for any parent who has begun weaning their baby onto solid foods is what to feed them? to buy ready foods or make our own? what recipes to follow? Here I will share with you the various simple recipes that I make for Baby A, ones that he really enjoys eating. Please note I am not a nutritionist, and these recipes are made as per my understanding and after speaking to my mum and friends with children. Please consult your health professional before introducing your baby to any food. 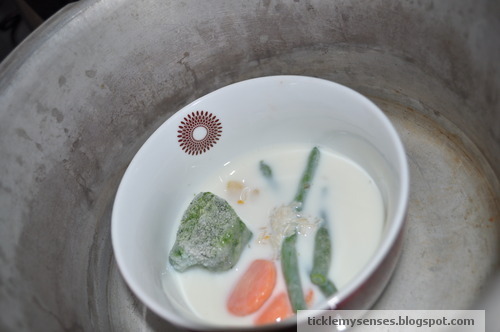 I tend to mainly use frozen vegetables to cook baby's food, as they make my life easy. 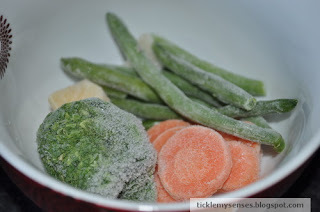 I keep a wide range of frozen vegetables in my freezer to ensure baby gets a wide variety nutrients from them. If you do not get frozen vegetables, then you can use fresh vegetables, just make sure they are thoroughly washed prior to cooking. Todays recipe is a Simple Vegetables ( Beans, Spinach and Carrots) with Rice and Lentils. I chose beans, spinach and carrots to accompany the rice and lentils, as spinach is loaded with iron which is very important for baby's at this stage (as baby's iron stores deplete by 6 months of age), and carrots and beans have various vitamins and minerals, rice is a good source of carbohydrate (easily digested) and mung dal a good source of protein.You can use other vegetables like broccoli, peas, butternut squash, celery, radish with the same recipe for variety. 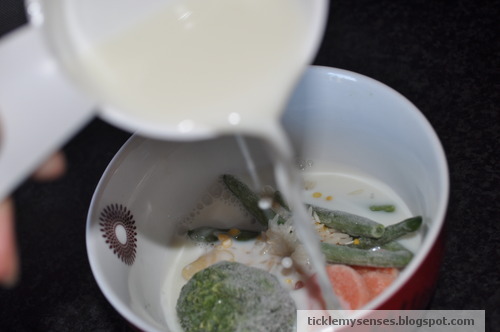 I cooked all these ingredients in a heat proof bowl with milk in a pressure cooker with sufficient water. 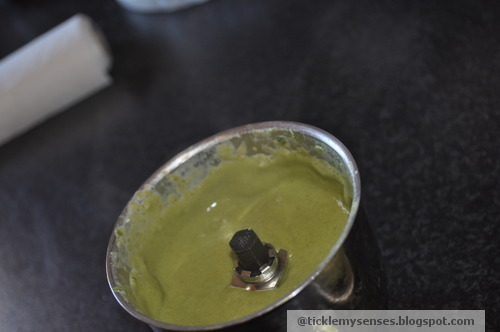 Then pureed everything in a clean blender and cooled it down before feeding him. My health visitor suggested accompanying baby's meals with a little diluted fruit juice, as it contains Vitamin C ( like apple, pear, berry juice, mango) which helps in the absorption of iron in the food. Makes 1 serving for 7-8 month baby. 1. Place washed rice, dal in a heat proof bowl. Place the bowl in a pressure cook which has been filled with water upto 1/3rd its depth. 2. Pressure cook for 2 whistles. Let the pressure drop before opening. 3. Put the cooked food into a clean mixie and puree for a few seconds. 4. 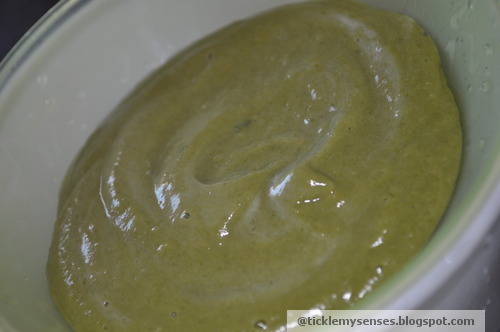 Pour the prepared puree into a clean bowl, cool over a cold water filled bowl, feed baby. I usually feed baby this dish for lunch. He has it along with a few sips of fresh diluted fruit juice which is rich in Vitamin C, that helps baby's intestines absorb all of the iron in the food. You can double the quantity of ingredients to increase the quantity of food you prepare, for freezing. To Freeze food: Puree the food, pour into freezer pots, let it cool down completely to room temperature before placing the lids and placing in the freezer. 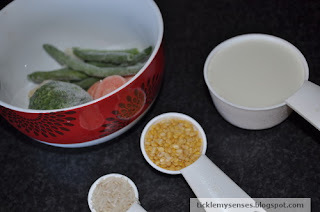 To Serve: Take the frozen food pots out from the freezer a couple of hours prior to serving to allow the food to defrost. Then heat thoroughly in a microwave on a medium setting for 2 minutes. ( be careful to avoid hot spots in food by mixing the heated food well, and make sure you cool down food, over a bowl of cold water before feeding baby).